Learn the Many Benefits CBD Offers for Treating Anxiety. Multiple research studies of using cannabidiol or CBD for anxiety have shown promising results. CBD is a chemical that is naturally found in hemp or marijuana plants. But, it is entirely different from THC that is responsible for giving the feeling of ‘high’. In contrast, more people are exploring are exploring the many CBD health benefits. Anxiety is the natural response of our body that helps us cope up with certain threats. It also helps us recognize the potential threats and take action to better the situation. But, there are times when we are unable to manage the anxiety, and it starts to impact our personal and professional life. Anxiety disorders are more common than one can imagine and it affects about 100 million people around the world. Even though many drugs treat anxiety-disorder, they have unfavorable side effects. It is the reason why more people are turning to alternative natural treatment such as using CBD oil. CBD oil works with the 5-HT1A serotonin receptors in our brain that is responsible for receiving chemical signals from different stimuli and makes the cells respond to it. 5-HT1A receptors are essential for treating people with anxiety disorders, and CBD oil binds directly to these receptors and boosts the signaling. The effects of CBD oil on these receptors are much faster than other prescribed conventional drugs. Also, it also promotes the neurogenesis in the hippocampus area of the brain that is responsible for the brain function. People suffering from anxiety or depression have a smaller hippocampus, and CBD oil has been proven to aid in the regeneration of neurons in the area. Some of the benefits of using CBD oil for anxiety are an improvement in sleep, improvement in mood, relaxing effect on the body, calms the mind, and an improved sense of well being. Further CBD health benefits are growing with research, and it is not long before it is accepted as a viable treatment for anxiety disorder. 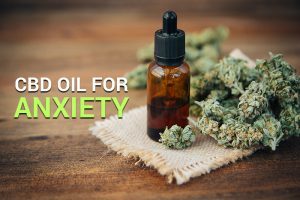 Even though further benefits of using CBD oil are still being explored, it might actually become one of the safest and effective methods for treating anxiety disorder in the years to come. The dosage needed for treating anxiety will differ from person to person. It is best to start with a small dosage of CBD and then gradually increase until one can see a difference. Since CBD oil does not cause any psychotic episodes like its THC counterpart, one can experiment with different dosage range to know what is best for them.